I am back! Back on the blog and back from my trip to Iceland and Scotland. Oh how I think of writing on here every week and then I wonder what of interest I could write about. I found something of interest to write about. Something that you ATC members may already know about if you have received the latest edition of AT Journeys. Two nights ago, I received an email from Phys Ed, who many of you may remember as one of good friends that we met on the AT and who we stayed with in Gettysburg. He said that he just received his copy of the magazine and recognized me in it. I had no idea that it was the cover until he sent me a photo of it the next morning. I was floored. I had sent in some photos from our thru-hike awhile ago, I can’t even remember exactly when I submitted this and a few other photos to the ATC, but it was over a year ago. This is one of my favorite photos from our hike, although I suppose it technically post thru-hike. I’m very proud of my dad and his cover photo is well-deserved on this national publication! Apart from how cool it is to see this magazine cover, I really want to read the article and see how they have approached the subject of “treading lightly” in the park and I’m sure conservation of the entire trail in the article. 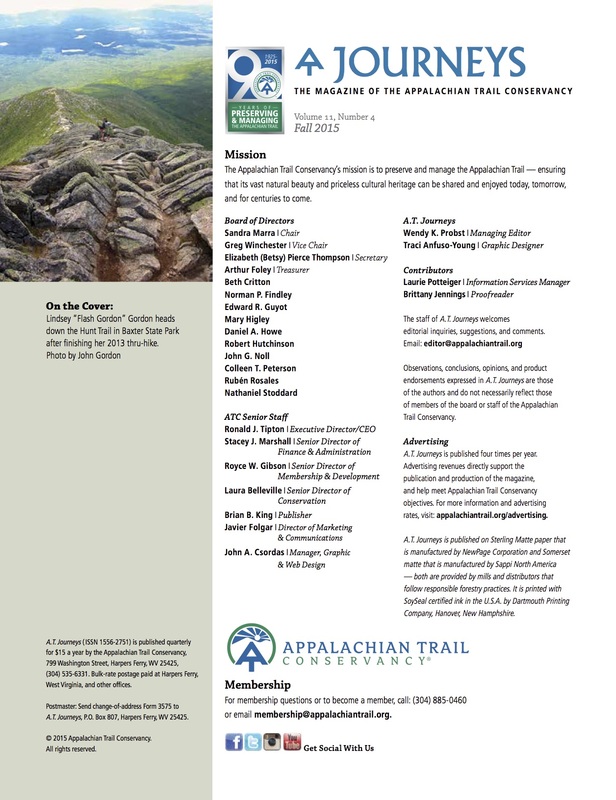 Finding the balance between wanting to share the trail with more people and conserving it for generations to come is a challenge that all of who are connected with the AT will have to contemplate and become active in achieving. Never could I have imagined when I decided that I wanted to thru-hike 3 years ago that the back of my head (my best side) would grace the cover of a magazine. As many of you may know from reading my blog entry about our climb up Katahdin, my dad didn’t have the best time those last few miles as we descended the mountain. Wouldn’t you say it was all worth it now, dad? Miss your adventures. You should write more. I also received mt ATC magazine this week and was reading it while waiting for my husband to go in for surgery. 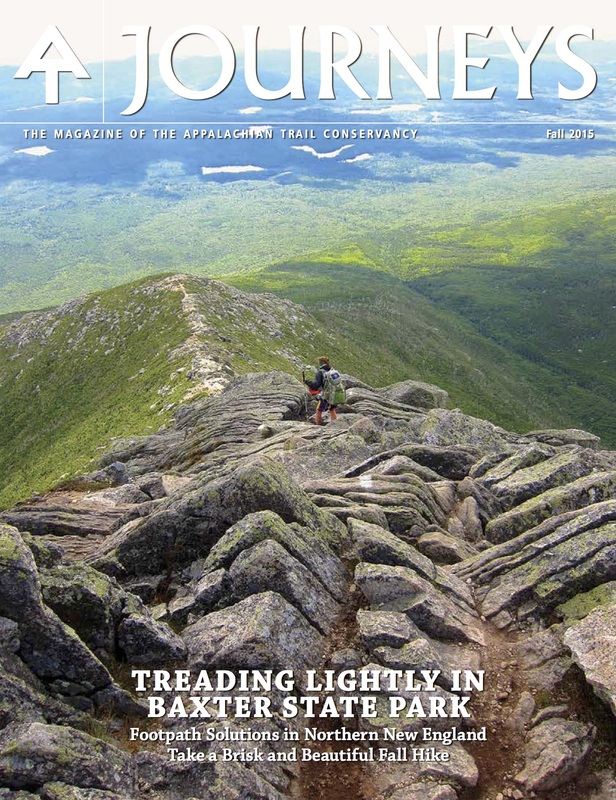 When I saw the reference of who was on the cover, i said ” Oh my, that’s our girl from Maine who did the thru hike two years ago”. Very cool! Amazing post. I read your travels in trail journals (years ago) and remain inspired to keep on trekking. Thank you for the posts. Absolutely, worth it! One of the more memorable days of my life, for sure. Thanks, again, for helping me get down! 😉 Glad I was there and able to grab this pic. Love,dad. PS: I agree with Jim, you should write more. A sign of life 😉 Great news. You really should write more. Greetings from Germany! Dang good to hear from you. Book soon? Great pic! I loved reading your posts from the trail! Miss them!